Yesterday, the CalCAN- and CAFF-sponsored Senate Bill 367: The Agricultural Climate Benefits Act passed out of the Senate Environmental Quality Committee with a unanimous bipartisan vote of 7-0. This follows SB 367’s unanimous bipartisan approval by the Senate Agriculture Committee earlier this month. 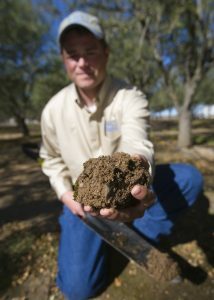 In January, Governor Brown signaled a new focus on ‘Healthy Soils’ in his inaugural address and budget proposal. This landmark effort would seek to increase the soil organic matter in California’s agricultural lands, producing benefits for water retention, soil stability, nutrient use efficiency, and greenhouse gas reductions. SB 367 would provide funding and a policy framework to pursue many of these same benefits, and it is no coincidence that SB 367 and the state’s ‘Healthy Soils Initiative’ are highly aligned in their timing, goals and approach. Agencies and the Governor’s administration have been working together over the last several months to design the ‘Healthy Soils Initiative’, and have just released a first glimpse at what this effort seeks to do, and how it seeks to do it. A two-page document released by the California Department of Food and Agriculture (CDFA) cites the multiple co-benefits of soil organic matter in our agricultural soils and proposes some efforts that the state might take to increase carbon in soils. In its outline form, the Healthy Soils Initiative would take a multi-faceted approach to the challenge of building soil organic matter across the state’s diverse agricultural landscapes. The state recognizes the importance of research, education, and technical support in this effort, as well as the creation of incentives and market opportunities to promote healthy soil management practices. We are pleased to see the document’s collaborative approach: CDFA, the Department of Conservation, CalRecycle, the Department of Water Resources, the Department of Pesticide Regulation, and the Air Resources Board would all have roles to play. Although this type of cross-agency coordination can be difficult in practice, it is a necessity given the complexities at the climate-agriculture nexus. The proposal also states a clear role for California’s Resource Conservation Districts and UC Cooperative Extension, whose work is critical in bringing research out into the fields and demonstrating how growers can benefit from biologically-based soil management practices. Perhaps most notably, under this proposal the state would have until the end of this year to establish “a short- and long-term goal for building soil organic matter in California’s agricultural and degraded soils”. Governor Brown is big on setting ambitious goals to build excitement and spur decisive action – we expect the Healthy Soils goals to establish a benchmark for years to come. CalCAN and our partners have long advocated for many of the approaches and actions outlined in the Healthy Soils Initiative proposal. In particular, our Blueprint for a California Program on Climate and Agriculture – which was crafted with input from dozens of stakeholders and experts – recommends many of these same program components. We are excited to see a concerted effort by the state to not only set concrete goals for improved soil management, but also to make sure that the research and technical assistance communities are part of the conversation from the get-go. In order to make progress on soil health, however, the state must reinvest in technical assistance and show on-the-ground successes through incentives and demonstration projects accessible to growers. Goals, meetings, and plans will do little unless backed up by funding and action. That’s why SB 367 would direct funds from California’s cap-and-trade program to incentivize climate-friendly farming and ranching practices. Thanks to the innovative efforts of growers and organizations across the state, we are closer than ever to seeing a workable vision for climate-friendly agriculture being deployed across California. CalCAN will continue to engage as this effort involves, and we hope you will continue to lend your voice to the conversation.